Fun Gun Gear Review Presents: The CRKT “Chanceinhell” Ken Onion Design Survival Machete. Brand new offering from CRKT and up to the name. What a great Blade to have in the field. First off it cracks me up people flame “nice paid endorsement ” ..have you never watched this channel before? If sootch says its good..its good. Sootch is a phenomenal real man’s prepper, pay attention you might learn something..
Now this review is outstanding, I was impressed with the size verse cutting power this blade was able to produce. Packing light with tools able to do multiple roles huge plus. Heavy blades or even a large ax would provide greater power to clear with but at far greater pack weight. Thanks sootch I have been looking for a good replacement for the hatchet in my pack,you just sold on this one. thanks for bringing this machete to my attention sootch. Looks like a good blade for general utility around the house. Hi, late comment here. Is the blade full tang? personally sootch you should have kept the underbrush around the house make it harder for people to get through to your home. You make good videos. Did you change the name of your channel or did you have another channel by a different name? I seem to remember a different name. I ordered mine from CRKT brand new, when I received it the packaging was open and the blade was bent. Please do yourself a favor and buy a better product. It says alot about a company when they send out returned merchandise as “brand new”. What an awful company. One tool compromise. Hatchet, small saw (Corona or Silky) and thinner machete (if your cutting flexible small vines you need speed) will do all this, and a whole lot more with less work.This tool is great if you need the “macho” look, and only want to carry one tool. Hay, question. Is carbon steel rust resistant? I am almost always in situations where I have to MAKE SURE that the morning due doesn’t rust all 4 of my blades. Thank god for stainless steel, but is carbon steel better than that? Love the machete and video! That Intro made me nervous as hell. Looks nice, but I’ll stick with my military issued 1943 pacific campaign machete. Being much longer, I can clear thorn vines and poison ivy vines without having my hand as close. How can you NOT love it…it even has some zombie green on the sheath! Nice review and very funny. Hard for me to choose between that and the Kershaw Camp 10 or the Condor Pack Golok. I want a light copper and thee tools are in my opion a better buy than a large knife. Any thoughts? 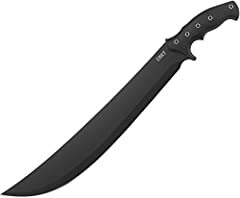 I am getting one of these machetes this weekend. Thank you for your review, Sir. I would rather have an axe if I wasn’t going through a viney area.